The Ivory Coast had a good side in the 2010 World Cup, but now they are just an afterthought as we are down to the final four. By the mid-1800s, French merchants discovered the large amounts ivory and gold that originated from Côte d'Ivoire (Ivory Coast in French). In exchange for money and the promise of French protection, France was given permission to take control of the country's coastal trade routes. With the hopes of planting profitable cash crops, the French began planting coffee, cocoa, and palm oil (an essential ingredient for preparing African food) along the coast. Eventually one-third of the cocoa, coffee, and banana plantations belonged to the French. As a result of France's push towards a strong economy based on cash crops, Côte d'Ivoire continued to mass-produce several crops after gaining its independence from France in 1960. Côte d'Ivoire is the world's leading producer of cocoa, and is the third largest producer of coffee in the world (behind Brazil and Columbia). More than one-quarter of the population works with the production of cocoa. Côte d'Ivoire also became Africa's leading exporter of pineapples and palm oil. Unfortunately, many of the country's rainforests have been destroyed in order to plant more cocoa (and other cash crop) plantations. Corn, rice, millet, and yams have also thrived, but mostly as crops eaten by the people of Côte d'Ivoire. Cut the bananas lengthwise, then into little pieces. Pour about 4 inches of oil into a saucepan and heat until boiling. 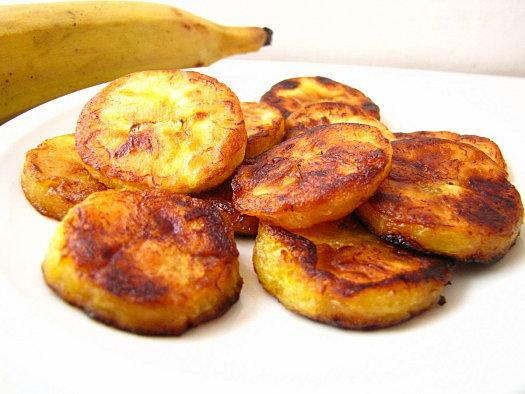 Place ½ of the sliced bananas into the oil. Fry both sides until reddish-brown, then very carefully remove. Fry the other ½, then remove. Serve immediately alone, or with grilled fish. Ivory Coast, much like its West African neighbors, produces an abundance of palm wine for consumption. I've covered very similar beverages in posts about Nigeria, Ghana, and Cameroon, so check them out for more information. For a few notes about beer in the Ivory Coast, check out the BR Beer Scene.